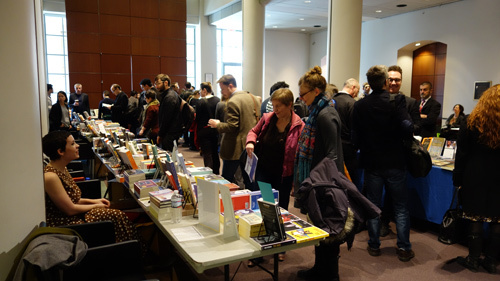 Some 3,500 students and professors from around the world filled the hallways and classrooms of New York University in late March for the annual conference of the American Comparative Literature Association (www.acla.org). Most of the attendees presented papers that expanded on the conference’s “Capitals” theme. About a dozen book publishers peddled their wares and hobnobbed with writers (see photo). Watch this web site for a report on “Publishing Your First Book: Tips from Writers, Editors and Publishers,” a conference workshop that provided some useful insight into the academic publishing process.